Review posted April 7, 2016. I have to admit, I have a problem with Imaginary Friend books. Including award-winning ones. Somewhere, the mechanism (that they do have a life of their own) breaks down. My suspension of disbelief is never perfect, and I can’t thoroughly enjoy the book. That said, this one has less lack of logic than most. And the illustrations are by Oliver Jeffers! Fred is an imaginary friend who likes it when he’s summoned. He tries to be a good imaginary friend. But no matter how hard Fred tried, the same thing happened every time. One day, his friend would find a real friend in the real world. A friend who did not have to be ignored when grown-ups were around. When this day came, as it always did, Fred would feel himself fade. Eventually, the wind would blow him up to a cloud, where he’d wait to be summoned by another lonely child. When Sam summons Fred, Fred knows he’s different. They share more interests than any friend Fred has had before. 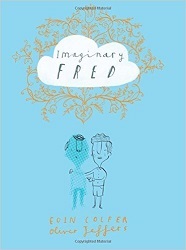 When Sam makes a real friend, Sammi, Fred is sure he’s doomed… until he meets Sammi’s imaginary friend Frieda. Part of the fun of this book is in the details. Sam and Fred, who both love to read, are pictured reading the authors’ books, Artemis Fowl and Lost and Found. When the four friends perform in a quartet, grown-ups in the audience are very confused. I like when the friends practice speaking French. Okay, there are still quibbles. If there’s an “imaginary community” as we learn at the end, how is this the first friendship between two imaginary friends, anyway? But when it comes down to it, I can overlook my quibbles, because I kept coming back to and enjoying this book. If it tried to be general it would fail, but as a story about these particular four friends? This is an entertaining story which rewards repeated readings and gets you thinking about imagination and friendship and how they come together.